I confess, I was initially a wee bit disturbed by the concept of I Now Pronounce You Someone Else by Erin McCahan. 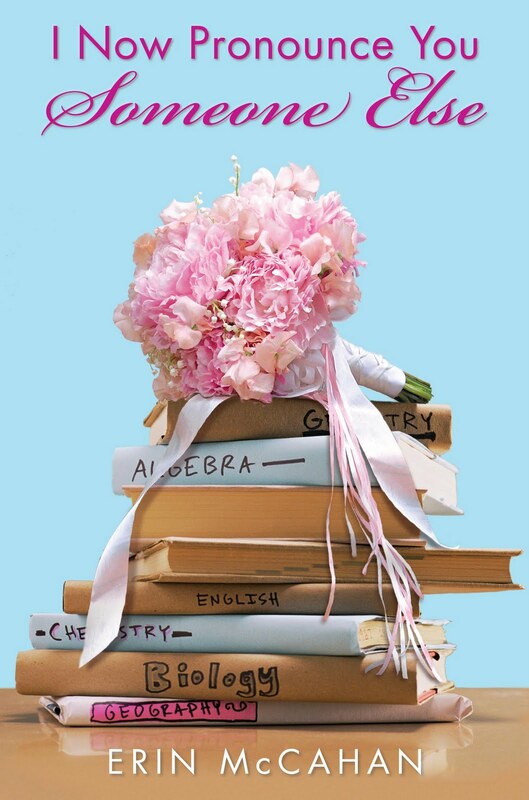 The book, after all, is about a girl who gets engaged while she’s still a senior in high school. And this was not a post-graduation, “I’ll marry you if you turn me into a vampire” type of engagement. (Which I can forgive, since I’m a sucker for those vampires. Pun intended.) Just humans. Just getting engaged. But the way McCahan has written it, the premise totally and completely works. It’s not creepy or weird — and the awkwardness of planning a wedding while getting homework done and submitting college applications is actually part of the story. Any reservations you may have about the concept are all addressed within the context of the story. I Now Pronounce You Someone Else is a character study, more than anything else. We follow 18-year-old Bronwen Oliver as she struggles with a nasty break-up, falling in love with an older guy, and trying to fit in with her mother, step-father and “Jesus-like” older brother (all of whom she swears she’s not actually related to). Bronwen isn’t facing any extraordinary hardship at this moment in her life (despite the past heartache of her father’s death.) But it’s her normalcy that makes her so relatable. We’ve all been in her shoes at some point in our lives: struggling to figure out who we are, where we fit in the world, and what it is we really want out of life. As an older reader, it was frustrating at parts to watch Bronwen making the wrong decisions … but it was equally refreshing to see her learn from those mistakes and grow from them. There were parts when things finally started to make sense for Bronwen, when I wanted to stand up and cheer and yell, “Go, girl!” And I say this having made some pretty big mistakes in my own life — and having grown up enough that I can reflect on those mistakes and see how much they helped shape me into the person I am today. The way McCahan writes I Now Pronounce You Someone Else, we get to see Bronwen discover the same thing — her mistakes and how they helped shape her into a stronger person. And while there is much that goes wrong in Bronwen’s life, McCahan still manages to wrap things up with a happy — yet plausible — ending. Which left me a happy camper. Er, a happy “reader,” that is. I’ve had this on my “to read” list for awhile and I was curious to see how it might play out. I think I’ll bump it to the top now, because I’m intrigued.